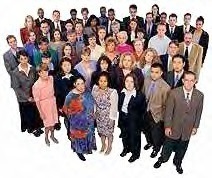 Qualify Buyers or Tenants the way FNMA or Freddie Mac or FHA or VA Qualifies them. This is how the bankers do it. This is a quick and accurate way toqualify your buyer or your tenant bo be sure they can qualify for the mortgage payment or monthly rent on your property. There is a lot of mumbo jumbo and smoke and mirrors associated with the mortgage qualification process but it can be made quite simple. This program will walk you through the Fanny Mae, Freddie Mac mortgage qualification process and give you clear insight as to whether your buyer can afford the loan payment or rental amount. To start all you enter is the current total gross income of the borrowers, their current car payments & credit card payments along with other loan monthly payments. Then you enter the loan or mortgage terms and read the percentages and what Fanny and Freddie recommend. 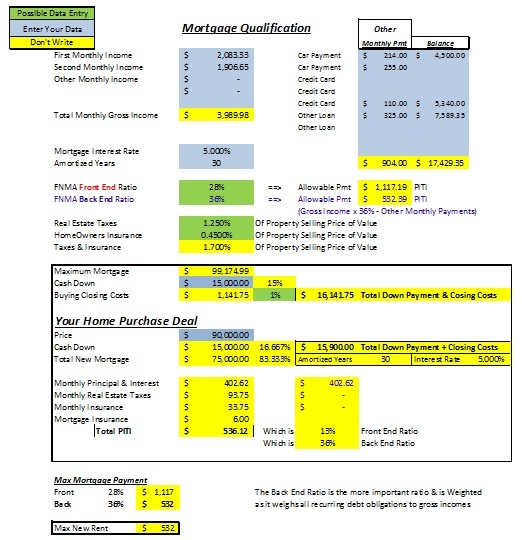 Run this simple Excel program to determine the amount of monthy housing expense or monthly payment your buyer or prospective tenant can comfortably carry. To summarize; Easy to use Excel program to tell you how much of a monthly payment your buyer or tenant can comfortably handle. It is much better to know what payment they can handle now rather than deal with the hassle of non-payment later. All you do is enter a few numbers in blue above and read the results.